The Engineering for All Project created, tested and optimized two-six week prototypical modules for middle school technology education classes, using the unifying themes and important social contexts of food and water. The modules employ engineering design as the core pedagogy and integrate content and practices from the Next Generation Science Standards (NGSS) and the Standards for Technological Literacy (STL). Embedded assessments make student learning visible to both teachers and students. 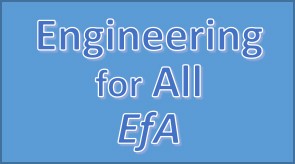 Materials are currently located on iteea.org (Engineering by Design).